Everyone has different tastes. Likewise with choices about destinations to visit while on vacation. There are those who prefer natural, culinary, mall, zoo or challenging destinations. For those who choose challenging destinations, they will always want to try without fear. A challenging destination and adrenaline rush is indeed more memorable. If you want your vacation to be extraordinary, you must try a destination that is challenging and different from usual. And nowadays, adrenaline-boosting destinations are increasingly popular. Like a playground that provides rides for roller coasters, polished coaster, and giant swing. And climbing high mountains is also becoming increasingly popular and in demand by people who like challenges. Do you also like that? One of the most popular rides is height-dependent rides. Even for those who are curious about this vehicle, even though they are afraid of the height, they still try it. And it turns out that Russia also has a popular destination that challenges you. This destination is located in one of Russia’s largest cities, Nizhny Novgorod. And this destination is very popular among tourists and is an obligation to ride it. His name is Nizhny Novgorod Cable Car. The Nizhny Novgorod Cable Car will not only make your heart beat because of flying at altitude, but will also fascinate you with the beauty of the city of Nizhny Novgorod. Especially if you ride this cable car in the afternoon. You will be able to watch the sun that is refracting on the Volga river. This is the true beauty of dusk! Your fear will disappear when you see the beauty of this city. In this article, we will eliminate your curiosity by presenting interesting facts about this cable car. Here are 5 interesting things you should know about the Nizhny Novgorod Cable Car. This cable car has been very popular even though it is only 6 years old. This cable car was officially opened on February 9, 2012. Nizhny Novgorod Volga Aerial Tramway was built by Poma. Travel using the cable car for 13 minutes. The cable car crosses the Volga river in a range of 900 meters on two poles with a height of 82 meters, and six other poles. When you are above the cable car, you can see the beauty of Nizhny Novgorod in total and also the charm of the Volga river. A 13-minute journey is certainly quite satisfying, you see the entire city of Nizhny Novgorod. The 3660-meter Nizhny Novgorod Cable Car crosses the Volga River in Russia. Volga River is the longest river in Europe. This cable car connects the city of Nizhny Novgorod to Bor city. This cable car is at an altitude of 61 meters above the Volga River. When you ride this cable car, you don’t need to be afraid because security is guaranteed. And this cable car has also received an award from the Guinness World Record. If you are interested in this vehicle, you have to pay 100 rubles. If you visit Nizhny Novgorod you should try this vehicle. When else can you see the longest river in Europe totally? You can only see it by riding the Nizhny Novgorod Cable Car. Not only as an entertainment vehicle, it turns out that the cable car is also a transportation for the people of Bor City and Nizhny Novgorod. Bor City residents use a cable car if they want to go to Nizhny Novgorod. Many residents of Bor City use the cable car to go to lunch at the Nizhny Novgorod restaurant. Nizhny Novgorod is also famous for its restaurant with delicious food. Naturally, if the residents of Bor City choose to eat lunch in the Nizhny Novgrod directory. Are you still afraid to ride the cable car? Even the residents of Bor and Nizhny Novgorod used it as a public transportation tool. They are really brave. Russia does have an extreme winter. And because this is why during the winter there are often delays when you want to ride the cable car. They fear something will happen to their visitors. during the winter, the cable car movement often slows down or even stops. So you don’t worry if you suddenly freeze inside the cable car at an altitude of 61 meters above the Volga river. so, you better not visit it in winter. Besides they often delay, it’s also quite risky for your safety. And the view of the Volga river in winter isn’t too good either. The best time to ride this vehicle is in the spring or autumn. Apart from not endangering your safety, during the fall or spring, the Volga river really shows its charm. And the city of Nizhny Novgorod also looks more beautiful. You will also enjoy the weather more. So, we recommend that if you want to try this vehicle, you better ride it in the spring or autumn to avoid things that are not desirable. 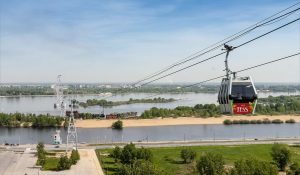 Initially, the Nizhny Novgorod Cable Car was made to be used as modern transportation in order to arrive quickly to the embankment at Nizhny Novgorod in the Bor center located on the banks of the Volga river. However, because many are interested in this tool, the cable car is also used as a landmark and tourist attraction. The cable car is located near the Kremlin. The Nizhny Novgorod Cable Car can be ridden by children. However, it’s better if parents accompany him. Nizhny Novgorod is a proud city of art and history in Russia. famous places in this place are Kremlin, Chkalov Staircase, Bolshaya Pokrovskaya Street, and Piskunova Ulitsa. These destinations are culinary destinations, history, and also the art of photography. however, it turns out this city also provides challenging rides for tourists who want to see the total charm of the Volga river. This vehicle is a favorite of tourists. Because of the crowded visitors, you must be willing to queue if you want to ride this vehicle. Although waiting in line, all your efforts will be paid off by seeing the beauty of the longest river in Europe, the Volga river. Those are 5 interesting things you should know about the Nizhny Novgorod Cable Car. Cable car is an icon of the Nizhny Novgorod and one of the most popular tourist attractions there. For those of you who like challenges, the cable car is a tourist attraction that you must try. And for those of you who are afraid of heights, you still have to try it. You have to see the beauty of the Volga river, your fear will definitely disappear.